Scarlets re-invigorated their Champions Cup campaign with a dominant bonus-point win against Benetton in Treviso. A week after struggling to beat a 14-man Benetton side, they scored four tries in the wintry Italian sun. Two touchdowns by Gareth Davies and one each for Johnny McNicholl and Paul Asquith secured the bonus point inside 44 minutes. Monty Ioane's tries were a consolation as Scarlets briefly moved top of Pool 5 before Bath's 26-21 win over Toulon. Toulon's losing bonus point meant Scarlets dropping back to third in the table, butn they are only a point behind the English and French clubs. The day's results set up big matches in January when Scarlets face Bath at the Recreation Ground and then host Toulon. It was also a major improvement on their display at home to Benetton when they needed a last-minute try to clinch a 33-28 win. If Scarlets' preparations were disrupted by a flight cancellation which meant they arrived at their team hotel close to midnight on the eve of the match, they showed little sign of it in the opening half. Their clever kicking tactic exploited a huge gap between Benetton's first line of defence and full-back Jayden Hayward to good effect. It led directly to their opening two tries for McNicholl after Asquith had gathered and passed the ball and then for Asquith after McNicholl returned the compliment. 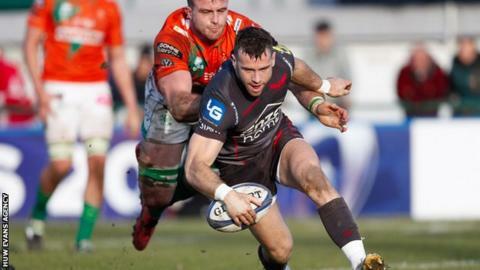 When Gareth Davies darted over from a close-range scrum just before the interval the only question outstanding was whether the Welsh region could harvest a bonus point. It took less than four minutes for Davies to provide the answer as he crossed for his second try. The match deteriorated from that point with Ioane profiting with two tries - one in each corner - in the final five minutes. Scarlets head coach Wayne Pivac: "Last week we weren't happy with our defence and our lack of physicality defensively and that was the focus throughout the week and to be fair at 31-0 and the game done and dusted it was job done really. "Today was about keeping the competition alive. This is the one we really wanted to nail and put in a good performance not just for the travelling supporters but for the supporters back home. We look forward now to travelling to Bath which is going to be a big occasion."